Fareham Town overcame a nightmare journey to win 3-2 at Hallen Town in the FA Vase. The Reds did not arrive in Gloucestershire until 15 minutes before kick-off – after spending over four hours in a coach. ‘It was the journey from hell,’ said manager Pete Stiles. ‘On a hot day the air conditioning didn’t work and we spent two hours stuck on the motorway. ‘The preparation wasn’t the best and it showed in our first-half display. After falling behind to an early goal, Fareham hit back with strikes from Gary Austin and Junior Kamara. Hallen levelled with a free-kick but Garry Moody popped up with a winner in the second half. ‘We totally dominated the second period and deserved to go through to the next round,’ added Stiles. Baffins Milton Rovers edged through thanks to a 3-2 extra-time win at Fairford Town. However, boss Steve Leigh was far from impressed with the performance. ‘We were awful and just never got going,’ he said. ‘It is probably the worst performance since I have been here. Rob Taw scored either side of half-time to put the visitors in charge. 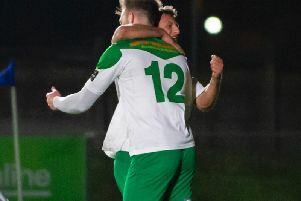 Two goals from corners allowed Fairford to level matters before Shane Cornish produced a spectacular 25-yard free-kick to win it in extra-time. AFC Portchester had a day to forget as they crashed out 6-0 at FC Bashley. Joint-boss Mick Catlin said: ‘It was a terrible day. I have never seen us make so many individual errors. Goals from Harry Jackson (four) and Alfie Lis gave Horndean a 5-0 Wessex League premier division win over Andover New Street at Five Heads Park.